As part of the security of the device there are no "backdoor" passwords or ways for IronKey to restore the device for you. If you are unable to recall your password, we can only provide helpful tips on how to remember or recover it. After 10 failed consecutive password attempts, the device will either reset or permanently self-destruct based on this setting.This feature is configured at the time the device is initially set up and can be updated in the Preferences menu of the IronKey Control Panel.The reset function will wipe all your data and the AES Encryption keys on your device, so your data will not be recoverable, but allows you to initialize and use the device again. Please note: this option must have already been set within the IronKey Control Panel. Without unlocking the device there is no way to change from self-destruct to reset. IronKey Enterprise S1000 users may contact their IronKey Enterprise Administrator for password assistance. How do I upgrade IronKey S1000 Basic to Enterprise? 3. In Windows double click on the drive labeled “IronKey Unlocker” and then on "Ironkey.exe". In Mac double click on "Ironkey.app"
If you have any questions or trouble with your device, please contact your system administrator. An employee is leaving the company and I need to re-commision the Enterprise drive for a new user. When do I delete the user or drive from the admin console? The user and/or device should NOT be deleted if you want to assign the drive to a different user. The Administrator should re-commission the drive. The following will occur if you delete the device or the user. You have selected 1 device for deletion. You cannot undo this operation. Would you like to continue. Once you select OK you will see Device deleted successfully. Consequences: When you plug in the device it will ask for a password. But there is no password to enter now because the drive has been deleted. You will see this message. You have selected to delete this user. This will also delete the device. Would you like to continue? You can only use the drive as long as there is no internet connection. Can I change an Enterprise managed drive to a Basic drive? No, an Enterprise device cannot be switched to become a Basic device since this could open up security vulnerability. Furthermore, once a Basic device has been upgraded to an Enterprise device, it cannot revert back to a Basic model even after resetting or reassigning the drive through IronKey Enterprise Cloud Management Service or On-Premises Server. What is the difference between "Disable and "Detonate" in the Silver Bullet Service? The Silver Bullet Service comes with two main features: You can either disable a device (and later re-enable it) or detonate it. If you detonate a device, this will trigger its built-in self-destruct mechanism and the device will become permanently unusable. Disabled devices can be unlocked or re-commissioned (after enabled) and issued to a different user. Disabling a device will not free up a license but detonating it will. Can I still use an Enterprise drive after EMS service has been cancelled? If your company has enabled the phone home feature and the account is suspended, the drive becomes useless. You will no longer be able to log in or use the drive. The only way you can use as a stand-alone is if the account was set up without the silver bullet and phone home feature. I just purchased an S1000 Enterprise and is asking for an activation code. How do I activate the drive? Unfortunately it appears you might have purchased the incorrect type of drive. Note that the IronKey Enterprise devices are designed for large-scale deployments and the use of a centrally managed IronKey Enterprise Management Service (a yearly license per device and separate purchase) is needed. It is this Management Service that issues activation codes and administered by an administrator. A minimum of two devices is needed to run an Enterprise account. The device for you would have been the S1000 Basic. This drive does not require the management software and licenses. Where do I find the serial number for my Ironkey drive? 4. 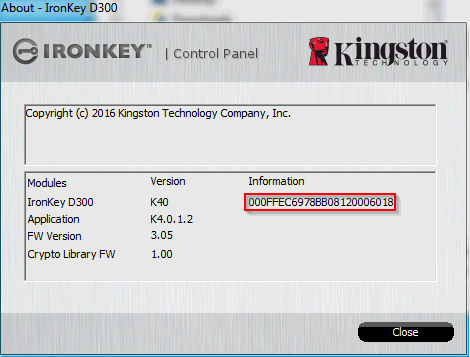 In the windows System tray (bottom right corner of windows), right click on IronKey icon and select "About IronKey D300"